Procolophonids were diverse small reptiles through the late Permian and Triassic. Relatively complete specimens of various taxa are known from the Early and Late Triassic, but the 10 or so Middle Triassic taxa, from South Africa, Russia, China and the UK, are mostly incomplete, being known only from skulls or partial and poorly preserved isolated elements. Because of their small size, it has often been difficult to establish details of anatomy using physical preparation methods, so application of scanning technology can massively improve knowledge. Here, we describe the first substantial portion of a skull and anterior postcranial skeleton of the genus Kapes, known from Russia and the UK. CT scanning and 3D digital restoration of the new specimen from the Anisian Otter Sandstone of Devon, UK, reveal anatomical details previously unknown for this taxon, most notably the enlarged quadratojugal processes. This is also one of the few mature procolophonid specimens with a preserved postcranium, and it gives valuable insight into ossification patterns. Fused sutures of the skull, fused scapulocoracoid, and heavily worn teeth show evidence of the common reptilian ossification pattern with a possible limitation in tooth replacement. 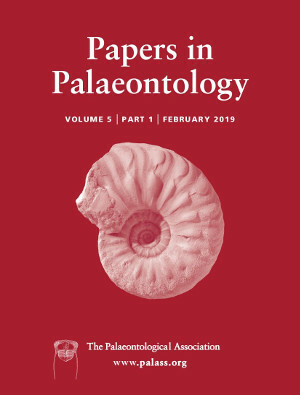 There is sufficient anatomical information to include Kapes bentoni for the first time in a cladistic analysis, which shows that it is sister to the Russian Kapes majmesculae and part of a clade of Anisian taxa phylogenetically more basal than Procolophon. Inferences on the function of the quadratojugal spines and fossorial mode of life are also considered. Procolophonids (Family Procolophonidae) were generally small, superficially lizard‐like parareptiles, several of which were probably herbivorous. They arose in the late Permian and are widely reported in Triassic sediments from Europe, North America, China, South Africa, South America, Antarctica and Australia, before disappearing from the fossil record close to the Triassic–Jurassic boundary (Cisneros 2008a; Cisneros & Ruta 2010; Ruta et al. 2011). They are one of the few reptilian groups to have survived the Permian–Triassic mass extinction and, alongside their sister clade Owenettidae, the only parareptilians to have done so (Botha et al. 2007; Ruta et al. 2011). The late Permian record is limited mainly to the Owenettidae and Pintosaurus from Uruguay, but there is a rich Early Triassic record, including Procolophon from South Africa, Antarctica and Brazil. Likewise, there is good knowledge of the Late Triassic leptopleuronines such as Leptopleuron from the UK, Scoloparia and Hypsognathus from North America and Soturnia from Brazil. However, the fossil record of procolophonians in between is patchy, with some incompletely preserved taxa from the earlier part of the Middle Triassic, the Anisian and then a gap through the Ladinian and early Carnian (Cisneros 2008a). Anisian (including perhaps late Olenekian) procolophonids include Theledectes, Thelephon, Thelerpeton and Teratophon from the Burgersdorp Formation of South Africa, Eumetabolodon bathycephalus and Pentaedrusaurus from the upper Heshanggou Formation of northern China, Neoprocolophon from the middle or upper Ermaying Formation, northern China, and Sclerosaurus from the upper Buntsandstein of Switzerland. Most interesting biogeographically is the genus Kapes, known from several species from the Yarenskian (Olenekian) and Donguz (Anisian) gorizonts of Russia (Ivakhnenko 1975, 1983; Novikov 1992; Spencer & Benton 2000; Novikov & Sues 2004), and the Anisian Otter Sandstone (= Helsby Sandstone Formation) of Devon, UK (Spencer & Storrs 2002). Of these Russian taxa, and after some nomenclatural confusion and proliferation (reviewed, Spencer & Benton 2000; Spencer & Storrs 2002), the most secure and complete material belongs to Kapes majmesculae (Ochev 1968) from the Donguz Svita of the south Urals, of which there is an excellent skull housed in the Paleontological Institute, Moscow, PIN 4365/40, and described by Novikov & Sues (2004). The identification of the genus Kapes in the UK by Spencer & Storrs (2002) provided an important geographical link between the terrestrial red beds of Russia and those of western Europe, at a time when the intervening Germanic basin was flooded by the Muschelkalk Sea, and from which such terrestrial fauna is largely unknown. Procolophonids were first reported from the Otter Sandstone by Spencer & Isaac (1983), and further reviewed by Milner et al. (1990), but without naming any taxa. These authors noted the difficulties of discriminating procolophonids from some enigmatic diapsids such as Anisodontosaurus when only jaw fragments were available. Spencer & Storrs (2002) further discriminated Otter Sandstone procolophonids from other clades and presented some of their earlier jaw material as well as the holotype of a new species, Kapes bentoni, a partial snout, comprising the maxillae and partial premaxillae, palate and mandibles. This was an important discovery that has been widely accepted, but it was too incomplete to be coded for the seminal cladistic analysis of procolophonid phylogeny by Cisneros (2008a). Here, we present a detailed anatomical description of a new specimen of Kapes bentoni from the Otter Sandstone of Devon, and we deploy CT scanning and 3D digital processing of the data for the first time on an Otter Sandstone specimen. There is sufficient anatomical information in the skull and anterior skeleton to include Kapes bentoni for the first time in a cladistic analysis, which shows, as expected, that it is sister to the Russian K. majmesculae and part of a clade of Anisian taxa phylogenetically more basal than Procolophon and its relatives, and the Middle–Late Triassic Leptopleuroninae. BP, Bernard Price Institute for Palaeontological Research, University of the Witwatersrand, Johannesburg, South Africa; BRSUG, University of Bristol, Geological Collection, UK; EXEMS, Royal Albert Memorial Museum, Exeter, UK; IVPP, Institute of Vertebrate Paleontology & Paleoanthropology, Beijing, China; PIN, Paleontological Institute of the Russian Academy of Sciences, Moscow, Russia. The Middle Triassic Otter Sandstone (Sherwood Sandstone Group: Helsby Sandstone Formation; Ambrose et al. 2014) of East Devon, south‐west England, reaches a thickness of about 210 m and is exposed along approximately 10 km of sea cliffs and intertidal foreshore ledges between the coastal towns of Budleigh Salterton and Sidmouth, forming part of the Dorset and East Devon Coast World Heritage Site (the ‘Jurassic Coast’). It comprises mostly fine‐grained reddish‐hued sandstones with subordinate conglomerates laid down by a generally northward‐flowing braided river system under a hot, seasonally semi‐arid climate (Benton et al. 2002; Edwards & Gallois 2004). Unfossiliferous aeolian sandstones occur at the base of the sequence and bands of red lacustrine mudstone become more conspicuous towards the top as the fluvial sandstones give way to poorly fossiliferous playa mudstones of the overlying Mercia Mudstone Group. The Otter Sandstone has yielded mostly fragmentary remains of diverse organisms including plants, arthropods, fishes, temnospondyl amphibians and a variety of reptiles (e.g. Spencer & Isaac 1983; Milner et al. 1990; Benton et al. 1994; Coram et al. in press). Invertebrate and vertebrate trace fossils also occur (Gallois 2013; Coram & Radley 2015). The fluvial Otter Sandstone has been subdivided into three members (Gallois 2004, 2013). Working upwards, these are the Otterton Point Sandstone Member, the Ladram Bay Sandstone Member, and the Pennington Point Member. Vertebrate skeletal material occurs throughout, but is most frequent towards the top of the sequence. All known procolophonid remains, including the new specimen, were recovered from the Pennington Point Member (possibly also the highest part of the underlying Ladram Bay Sandstone Member) of the coastal sections either side of Sidmouth, where these strata are exposed at shore level (Fig. 1). The vertebrate fossils indicate a broadly Anisian age for the Otter Sandstone (Benton et al. 2002), corresponding to the Perovkan land‐vertebrate faunachron of Lucas (1998, 2010). The approximately 15 m thick Pennington Point Member is equivalent to Hounslow & McIntosh's (2003) unit D which, on the basis of magnetostratigraphy, corresponds to the uppermost Anisian (Illyrian substage), possibly overlapping into the lowest Ladinian stage, making the age of these rocks c. 242 myr (Cohen et al. 2013). The new specimen, BRSUG 29950‐13, was collected by RAC in November 2014 from a temporary storm‐cleared foreshore exposure of the Pennington Point Member beneath Peak Hill, approximately 1.4 km west‐south‐west of the beach access at Jacob's Ladder, Sidmouth (National Grid Reference SY 109865). It is an incomplete skeleton of a procolophonid, exposed in dorsolateral view and comprising a skull, the cervical and most of the dorsal vertebral column and ribs, the shoulder girdle and most of the left forelimb (Fig. 2A). The hand of the left forelimb and the entire right forelimb are absent, probably a consequence of peri‐mortem damage. The pelvic region, hindlimbs and tail are also absent, probably mostly or entirely through recent erosion. There is some weathering damage to the right‐dorsal parts of the skull, and several vertebrae and right‐hand ribs, which were exposed prior to collection. Partial mechanical preparation by RAC revealed some further elements. The specimen has also been distorted by a rotational force, pushing the dorsal skull roof and rolling the entire vertebral column over towards the left‐hand side. Figure 2 Open in figure viewerPowerPoint Kapes bentoni Spencer & Storrs, 2002 (BRSUG 29950‐13). A, photograph of the specimen in the matrix. B, 3D digital reconstruction of the specimen free from the matrix in dorsal view. C, same as B but in ventral view. Abbreviations: a. cor, anterior coracoid; cl, clavicle; gl, glenoid; hu, humerus; icl, interclavicle; p. cor, posterior coracoid; ra, radius; sc, scapula; ul, ulna. Scale bar = 10 mm. Colour online. The fossil was found in a pale yellow‐brown sandstone bed c. 40 mm thick, which is rich in intraclasts, including small light‐coloured carbonate nodules (probably reworked rhizoliths), clusters of red mudstone pebbles, coprolites and vertebrate skeletal material. It overlies a relatively massive reddish sandstone approximately 1.25 m thick and is overlain by laterally variable heterolithic sandstones, mudstones and clay–pebble conglomerates. The underlying sandstone is interpreted as a channel bar which became subaerially exposed, evidenced by localized desiccation cracks, small gypsum nodules, in situ rhizoliths attributed to conifer trees (Purvis & Wright 1991) and chirotheriid footprints on the top surface (Coram et al. in press). The procolophonid‐bearing layer is interpreted as a channel lag deposited by a migrating river channel that inundated the exposed surface of the channel bar, the abundant intraclasts indicating a reasonably energetic and short‐lived water‐transported influx of material. Isolated vertebrate elements are moderately abundant, mostly attributable to temnospondyls, ‘rauisuchian’ archosaurs and rhynchosaurs. Showing varying degrees of wear and fragmentation, these were evidently transported, in common with material found in other Otter Sandstone channel lag deposits. In contrast, several small tetrapods recovered from this layer, including the procolophonid and small diapsid reptiles awaiting description, are more completely preserved and are interpreted as local inhabitants of the exposed channel bar which were either alive or only recently dead when overwhelmed by the sediment‐laden water. BRSUG 29950‐13 was converted into 3D digital models from computed tomography (CT) scans. The specimen was scanned at the University of Bristol, UK, on the Nikon X‐Tek H 225 ST X‐ray scanner, in two parts (anterior and posterior) both at 225 kV and 188 μA (42.3 W) from a rotating tungsten target, with 2 s exposure, 1 × binning, 24 dB gain, and a 3 mm copper filter, slice thickness = 48.45 μm, total number of slices = 1142. Each scan captured 3141 projections, with four frames averaged per projection. The two sets of reconstructed scan data were subsequently combined in VGStudio (v. 3; https://www.volumegraphics.com). A three‐dimensional model was created from the CT data using the segmentation tools in the software program Avizo (v. 9.1.1 Lite, Visualization Science Group; https://www.fei.com/software/amira-avizo/). Using the CT scans and segmentation, we identified several skeletal elements that would otherwise have remained hidden inside the matrix. All scan data and 3D models are available in Zaher et al. (2018, appendices S1–S2). Segmentation had to be performed manually because the matrix was heterogeneous and in some places very similar in density to the bone. The computer software distributes hues of grey colour across the generated projections based on the material densities measured by the X‐ray transmission, and ideally, there should be a significant difference in density between the two materials (Abel et al. 2012). The heterogeneous Otter Sandstone matrix was also a problem because it contains many carbonate rhizolith fragments and calcite crystals that have similar density to bone which, on occasion, contact the bones and make the boundary between bone and matrix fuzzy, especially in cases where calcite has invested the bone or where bone had been damaged. However, it was possible to distinguish matrix from bone with great certainty most of the time. Problematic areas were around the proximal and distal ends of the humerus, the left lateral and ventral aspects of the vertebral column, and internal skull bones; for most of these, the 3D models are less clear than they might have been. Despite close attention to these areas, some errors in the shape of the 3D models cannot be ruled out. We then performed retrodeformation (Lautenschlager 2016) to restore the original shape of the skeletal elements using the retrodeformation tool in the Landmark software (v. 3.6; http://www.idav.ucdavis.edu/research/EvoMorph). Five pairs of landmark points were used for the cranium (anteriormost and dorsoposteriormost points of the orbitotemporal openings, lateral‐most point of the cheeks, posteriormost points of the supratemporals, and mesial occlusal tips of the third preserved teeth in a row), five for the mandible (posteriormost points of articular, anteriormost points of ventral margin of the mandible, anterior‐ and posteriormost points of the adductor fossa, and tips of the first teeth of the dentaries) and eight for the vertebral column (on the posteriormost points of neural arches, and on the terminate dorsal tips of transverse processes). The humerus was manually retrodeformed using the transformation tool in Avizo because it was symmetrically compressed dorsoventrally, and landmark‐based retrodeformation would not have been effective. First, the cranium was transformed to be approximately the same as the cranium retrodeformed in Landmark, and then, the same transformation settings were applied to the humerus. Figure 3 Open in figure viewerPowerPoint Kapes bentoni Spencer & Storrs, 2002 (BRSUG 29950‐13), 3D representations and interpretive reconstructions of skull and mandible. A, original skull in dorsal view. B, digitally retrodeformed skull in dorsal view. C, reconstruction of the skull with possible suture lines in dorsal view. D, original skull in palatal view. E, digitally retrodeformed skull in palatal view. F, reconstruction of the skull with possible suture lines and occipital bones in palatal view. G, original cranium in ventral view, H, retrodeformed cranium in ventral view. I, reconstruction of the cranium with possible suture lines in ventral view. J, original mandible in occlusal view. K, digitally retrodeformed mandible in occlusal view. L, reconstruction of the mandible with possible suture lines in occlusal view. Reconstructions of missing parts based on Leptopleuron lacertium from Säilä (2010). Abbreviations: a, angular; art, articular; bo, basioccipital; bs, basisphenoid; co, coronoid; d, dentary; ect, ectopterygoid; eo, exoccipital; f, frontal; j, jugal; l, lacrimal; m, maxilla; n, nasal; p, parietal; pal, palatine; pm, premaxilla; po, postorbital; prf, prefrontal; pt, pterygoid; q, quadrate; qj, quadratojugal; sa, surangular; sp, splenial; sq, squamosal; st, supratemporal, v, vomer. Scale bars (upper for A–I, lower for J–L) represent 10 mm. Colour online. Figure 4 Open in figure viewerPowerPoint Kapes bentoni Spencer & Storrs, 2002 (BRSUG 29950‐13), 3D representations of the skull and mandible. A–B, original skull with mandible in: A, right lateral; B, left lateral view. C–D, digitally retrodeformed skull with mandible in: C, right lateral; D, left lateral view. E–F, digitally retrodeformed skull with unarticulated mandible in: E, right lateral; F, left lateral. G, original skull with mandible in anterior view. H, original skull in occipital view. I, digitally retrodeformed skull with mandible in anterior view. J, digitally retrodeformed skull in occipital view. Scale bars (upper for A–F, lower for G–J) represent 10 mm. Colour online. Figure 5 Open in figure viewerPowerPoint Kapes bentoni Spencer & Storrs, 2002 (BRSUG 29950‐13), reconstruction of the skull and mandible. A, lateral view. B, lateral view with unarticulated mandible. C, anterior view. D, occipital view. Reconstructions of missing parts based on Leptopleuron lacertium Owen, 1851, from Säilä (2010). Abbreviations: a, angular; art, articular; bo, basioccipital; co, coronoid; d, dentary; ect, ectopterygoid; eo, exoccipital; f, frontal; j, jugal; l, lacrimal; m, maxilla; n, nasal; opis, opisthotic; p, parietal; pm, premaxilla; po, postorbital; prf, prefrontal; pt, pterygoid; q, quadrate; qj, quadratojugal; sa, surangular; so, supraoccipital; sq, squamosal; st, supratemporal. Scale bar represents 10 mm. Colour online. Figure 6 Open in figure viewerPowerPoint Kapes bentoni Spencer & Storrs, 2002 (BRSUG 29950‐13), 3D representations and interpretive reconstruction of left mandible in medial view. A, original. B, digitally retrodeformed. C, interpretive reconstruction. Abbreviations: a, angular; art, articular; co, coronoid; d, dentary; sa, suangular; sp, splenial. Scale bar represents 10 mm. Colour online. Figure 7 Open in figure viewerPowerPoint Kapes bentoni Spencer & Storrs, 2002 (BRSUG 29950‐13), 3D representations of vertebral column. A, original in right lateral view. B, digitally retrodeformed in right lateral view. C, original in dorsal view. D, digitally retrodeformed in dorsal view. Abbreviations: ns, neural spine; poz, postzygapophysis; prz, prezygapophysis; trans. p., transverse process. Scale bar represents 10 mm. Colour online. Figure 8 Open in figure viewerPowerPoint Kapes bentoni Spencer & Storrs, 2002 (BRSUG 29950‐13), original 3D representation of interclavicle in: A, anterior; B, ventral; C, dorsal view. Scale bar represents 10 mm. Colour online. Figure 9 Open in figure viewerPowerPoint Kapes bentoni Spencer & Storrs, 2002 (BRSUG 29950‐13), original digital representation of scapulocoracoids. A–D, right scapulocoracoid in: A, medial; B, posterior; C, lateral; D, anterior view. E–H, left scapulocoracoid in: E, medial; F, posterior; G, lateral; H, anterior view. Abbreviations: gl, glenoid; igb, inferior glenoid buttress; p. cor, posterior coracoid; sc, scapula; sgb, supraglenoid buttress; spgb, superior glenoid buttress. Scale bar represents 10 mm. Colour online, Figure 10 Open in figure viewerPowerPoint Kapes bentoni Spencer & Storrs, 2002 (BRSUG 29950‐13), 3D representations and interpretive reconstructions of left humerus. A–D, original in: A, posteroventral; B, posterior; C, anterodorsal; D, anterior view. E–H, digitally retrodeformed in: E, posteroventral; F, posterior; G, anterodorsal; H, anterior view. I, original in proximal view. J, digitally retrodeformed in proximal view. K, original in distal view. L, digitally retrodeformed in distal view. M–P, interpretive reconstruction in: M, posteroventral; N, anterodorsal; O, proximal; P, distal view. Abbreviations: cap, capitulum; dpc, deltopectoral crest; ent, entepicondyle; ent. for., entepicondylar foramen; tr, trochlea. Scale bar (for A–L) represents 10 mm. Scale for M–P slightly enlarged. Colour online. Figure 11 Open in figure viewerPowerPoint Kapes bentoni Spencer & Storrs, 2002 (BRSUG 29950‐13), original 3D representation of left ulna in: A, dorsomedial; B, ventrolateral view. Scale bar represents 5 mm. Colour online. Figure 12 Open in figure viewerPowerPoint Kapes bentoni Spencer & Storrs, 2002 (BRSUG 29950‐13), original 3D representation of left radius in: A, medial; B, lateral view. Scale bar represents 5 mm. Colour online. BRSUG 26185, associated left and right maxillae with attached fragmentary premaxillae, left and right mandibular rami, including a right splenial, and fragments of the pterygoids or palatines (Spencer & Storrs 2002, figs 1–2). Uppermost Ladram Bay Sandstone Member or Pennington Point Member, Otter Sandstone (Helsby Sandstone Formation), Sherwood Sandstone Group, Anisian, Middle Triassic. Western end of Salcombe Hill Cliff, Sidmouth, East Devon, England (National Grid Reference: SY 130873). Upper molariforms much broader than long (length c. 45% of width), subtriangular in outline; lingual cusp narrower and normally higher than labial cusp; i2 much larger than first molariform; m4 usually slightly longer than broad, with narrow distal basin; M1–M4 directed strongly mesiodorsally. A distinct posterodorsally directed ridge extends along the maxilla from its origin immediately anterior to the maxillary conical tooth. Distinguished from K. amaenus by the absence of strong anterodistal compression of the upper part of lower molariform crowns. Distinguished from K. majmesculae by the variable position of a weak cingulum on all lower molariforms; the cingulum occurs at mid‐height in all lower molariforms of K. majmesculae. The current specimen can be identified as a procolophonian on the basis of its enlarged quadratojugal, the pineal foramen near the frontoparietal suture, the absence of a tabular and the T‐shaped interclavicle (Laurin & Reisz 1995; Tsuji & Müller 2009). It can further be identified as a procolophonid on the basis of three to four premaxillary teeth (probably) and the maxillary teeth with labiolingually expanded bases (Cisneros 2008a). It is a derived procolophonid based on two characters: posterior margin of the orbitotemporal fenestra extends beyond the posterior border of the pineal foramen, and six to eight maxillary teeth. Further, it is a member of the Triassic ‘horned procolophonids’ clade, based on the wide internarial bar, the presence of at least one quadratojugal spine, the basioccipital tuber projected far more posteriorly than the level of the quadrate condyle, and the probable prominent entepicondylar process on the humerus (Cisneros 2008a). It is excluded from the derived clade Leptopleuroninae because it lacks the steeply oblique ventral margin of the dentary, the articular lying well below the alveolar margin of the dentary teeth (even below the ventral margin of the dentary; cf. Säilä 2010, fig. 3A), and the straight posteromedial margin of the interclavicle. The new specimen presumably belongs to Procolophoninae, the clade defined as including all procolophonids that are related more closely to Procolophon trignoiceps than they are to Leptopleuron lacertinum (Modesto et al. 2002, p. 891). However, the sole apomorphy (postfrontal contacts frontal and parietal; Cisneros 2008a) cannot be determined in our specimen. Relationships of taxa within Procolophoninae (Timanophon raridentatus, Kapes spp., Thelephon contritus, Eumetabolodon bathycephalus, Procolophon trigoniceps, Thelerpeton oppressus, Teratophon spinigenis) are hard to establish because several taxa are incomplete, and there are disputes over the validity of some of them. One of the apomorphies for the Kapes–Thelephon clade of Cisneros (2008a, p. 358), the prefrontal medial border with a medial process, cannot be assessed in BRSUG 29950‐13 as the sutures on the skull roof are not visible. The other apomorphy, the quadratojugal lateral surface being spineless, does not apply to our specimen. It is unclear, however, whether these characters pertain only to Kapes cf. majmesculae from Russia (Novikov & Sues 2004) and there is uncertainty about the validity of the taxon Thelephon from South Africa (Cisneros 2008a, p. 358). Säilä (2008) found a different resolution of relationships of the above‐noted Middle Triassic taxa, with Kapes paired with Anomoidon from Germany, and Thelephon excluded, based on the single apomorphy of the prefrontal medial border with a medial process. We place our new specimen in Kapes based on the emended diagnosis of that genus given by Spencer & Storrs (2002, p. 449): ‘Distinguished from other procolophonine genera (sensu Ivakhnenko 1979) in that M1–M4 broader than long, becoming progressively larger and taller backwards to the maximum at the fourth position. Lingual cusp of lower molariforms subequal in height to labial cusps; cusps relatively close together. Coronoid does not bear a rugose spherical expansion capping its coronoid process dorsally’. Spencer & Storrs (2002) recognized that there had been considerable confusion in identifying species of Kapes, and they synonymized many Russian taxa, reducing the number of species to three: K. amaenus, K. majmesculae and K. komiensis, and some other tentatively retained species based on limited material. By comparison with the Russian species, Spencer & Storrs (2002, p. 450) established the new species Kapes bentoni based on a partial palate and jaws, comprising the maxillae, partial premaxillae, portions of palatines and pterygoids, and mandible (BRSUG 26185), as well as some other isolated jaw specimens (BRSUG 26186–9; EXEMS 60/1985.311). Spencer and Storrs were the first to recognize a species of Kapes outside Russia, and their identification of the genus and species from the Otter Sandstone has been accepted subsequently (e.g. Cisneros 2008a; Sues & Reisz 2008; Säilä 2010; Benton 2011; Fortuny et al. 2014). Is the new specimen an example of Kapes bentoni? All the characters in the original diagnosis can be confirmed in our specimen, except for the presence or absence of an anterodistal compression of the upper part of the lower molariform crowns, which could not be assessed because of tooth wear. Further, there is a possible cingulum on the molariforms in the right mandible, which would distinguish K. bentoni from K. majmesculae, but it is hard to confirm its position. There appear to be some minor differences, but some of these are difficult to determine in our 3D digital model, and others are somewhat equivocal in the holotype and type series, which are small specimens, prepared physically and so slightly damaged in places. Spencer & Storrs (2002, p. 454) noted that the dentary ‘incisiforms are equidimensional and essentially cylindrical throughout most of their length’, whereas in BRSUG 29950‐13 they are anteroposteriorly elongated with an ellipsoid base (Fig. 3J, L). Further, the dentary ‘incisiform teeth are approximately equal in height’ (Spencer & Storrs 2002, p. 454), but in BRSUG 29950‐13, the second incisiform is considerably smaller than the first (Fig. 4A, C, E). The first dentary incisiform in their original type series (BRSUG 26186) is broken off, so this character could not be confidently determined; indeed, the base of the tooth is considerably larger than the second incisiform, as in BRSUG 29950‐13, meaning that prior to breaking, it would have been more similar in height to BRSUG 29950‐13. Spencer & Storrs (2002, p. 454) also noted the weak peripheral cingulum in the dentary molariform teeth, but we could observe this only with some uncertainty in teeth of the left maxilla of BRSUG 29950‐13. The description of BRSUG 29950‐13 is based upon the specimen (Fig. 2A), and particularly the 3D model (Fig. 2B, C) because so many skeletal elements are concealed within the rock. Descriptions of the cranium, vertebral column and humerus are based on the retrodeformed 3D model. In other elements that were compressed symmetrically, retrodeformation did not prove to be especially useful. The main measurements of the skeletal elements are shown in Table 1. Measurements of 3D models taken in the Landmark software are not listed for dimensions which are not significantly affected by digital decompression. Estimated presacral length is calculated based on the length of preserved vertebral column and portion of the complete presacral vertebral column it represents. Skull length without qj horns was taken from anteriormost preserved point to posteriormost point of the parietal. Abbreviation: qj, quadratojugal. The skull is wide and triangular in dorsal view (Fig. 3A–C). The lateral margins of the antorbital region converge to form a pointed rostral end. Large and dorsoposteriorly elongated orbitotemporal openings occupy most of the skull surface in both dorsal and lateral views. The width and length of the skull are approximately the same (Table 1). However, the quadratojugal bones form elongated posterolaterally projecting spine‐like processes that add about 30% to the length of the skull and extend well back into the neck area. The overall shape of the skull is approximately the same as in Kapes cf. majmesculae (Novikov & Sues 2004) and Teratophon (Modesto & Damiani 2003), and is similar to Thelerpeton (Modesto & Damiani 2003). The bones of the skull are rigid and strongly integrated. We were unable to identify many sutures confidently, even when implementing an imaging technique, so we refrain from providing a detailed description of the individual bones of the skull. The only sutures we can identify with reasonable certainty are the following: those between maxilla and nasal, maxilla and jugal, quadratojugal and jugal, quadratojugal and squamosal, and quadratojugal and quadrate. Hypothetical reconstructions of the other sutures in our reconstructions (Figs 3, 5, 6) are based on Kapes cf. majmesculae (Novikov & Sues 2004). A solid skull is a recurring characteristic of procolophonids which was needed to resist the forces of mastication (Carroll & Lindsay 1985) or perhaps to endure forces imposed on the skull during head‐first burrowing (Wake 1993; Botha‐Brink & Smith 2012). The anterior tip of the snout is broken off, so, presumably, the premaxillae are largely or completely absent, as well as most of the external nares, except perhaps their posterior curved margins. The preserved dorsal margin of the snout begins to turn downwards before this point, which implies that the missing part did not contribute much to the preserved skull length. We thus interpret the snout as originally having been deep and short. The maxilla is relatively low dorsoventrally and shows no indication of the postnarial maxillary depression seen in many procolophonids (Cisneros 2008a), including the Russian Kapes specimen (Novikov & Sues 2004). However, this feature could be due to incompleteness (Fig. 4). Supralabial foramina are not present. Nonetheless, the maxillary depression may have been visible on the missing part. There are seven teeth preserved on the right side and five on the left, which was exposed outside the matrix. The tooth row terminates past the anterior margin of the orbitotemporal opening (as in most procolophonids apart from leptopleuronines) where it terminates prior to, or at the margin of the opening (Säilä 2010). The tooth row is slightly inset from the lateral margin of the snout, which, together with a more medially positioned mandible, provides space for a cheek area. Posteriorly, the maxilla is widened transversely to accommodate the bases of the enlarged, transversely broad, second to fourth molariform teeth. In lateral aspect, all teeth are triangular and increase in labiolingual width distally. The two posteriormost teeth are approximately the same in labiolingual width. The distalmost tooth is oriented at an angle anterolabially to distolingually, relative to the midline of the maxilla, whereas other teeth are positioned transversally to the same midline. The first three teeth are incisiform, followed by four molariform teeth. All molariform teeth, except the posteriormost one, show signs of heavy wear, such that maxillary and dentary teeth have oblique, almost edge‐to‐edge contact. The occlusal surfaces are almost completely flat and preserve the cusps poorly. The first three preserved teeth are conical and anterioposteriorly elongated, with a cingulum visible on the second one (Fig. 3D, E; Zaher et al. 2018, appendix S1). What we interpret as the cingulum could also be a result of a broken tooth, as that tooth is considerably smaller than surrounding teeth (Fig. 4A, C, E). Two premaxillary teeth are preserved on the right side, with the left counterparts missing. Considering the shape of the present snout margin, there was probably no space for more than one extra tooth. When observed in ventral view (Fig. 3D–F), the anteriormost tooth is positioned more laterally relative to the midline of the skull than expected from the first premaxillary tooth. In the PIN 4365/40 specimen of Kapes cf. majmesculae (Novikov & Sues 2004) there are three premaxillary teeth, so it is safe to assume that this was also the case for BRSUG 29950‐13. The first preserved tooth is considerably larger and longer than the following one, which is the smallest tooth in the row. The first preserved tooth could be positioned lower than originally because the bone around it is eroded away and it is now held by the remnants of the premaxilla and the matrix. However, in Kapes cf. majmesculae (Novikov & Sues 2004) the same size difference can be seen, so presumably the first preserved tooth is approximately in the original position. The following four molariform teeth were originally bicuspid, which can be observed from their outlines in palatal view (Fig. 3D–F). The posteriormost tooth is the least worn, so it still has a visible bicuspid shape, with a shallow groove between the widely spaced cusps. The lingual cusp is a little smaller than the labial cusp, and these are connected by a short transverse saddle. All molariform teeth are much broader than long, with the ratios of maximum anteroposterior width to labiolingual width of molariform teeth being around 0.60 (Table 2). In anterior view, all teeth display a marked asymmetry in surface shape. The labial side of the crown of the incisiform teeth is more convex than the lingual side, whereas the situation is the opposite in the molariform teeth. The crowns of the molariform teeth are more convex on their lingual sides. The molariform teeth are directed mesiodorsally, so the lingual cusps are positioned more dorsally than the labial ones. Labiolingual width in maxillary teeth was measured across the narrowest part of the tooth. Differences in measurements of the teeth between the left and right jaws arise from the uneven digital decompression of the mandibles. The shape of the maxillary teeth is very similar to those of the BRSUG 26189 Kapes bentoni specimen (Spencer & Storrs 2002, fig. 3), with some differences in the spacing (there is more space between the teeth in BRSUG 26189) and the position of the teeth (e.g. the lingual cusp of the posteriormost tooth of BRSUG 29950‐13 is rotated away from the lingual cusp of the adjacent tooth, whereas both teeth in BRSUG 26189 seem to be parallel to each other; all molariform teeth are positioned slightly diagonal to the long axis of the maxilla in BRSUG 29950‐13). The cusps in BRSUG 26189 are less flattened, and this, along with the other differences, might reflect age and individual variation. There are no visible teeth or denticles on the vomer or pterygoid, but because such palatal teeth are present in most procolophonids, including the PIN 4365/40 specimen of Kapes (Novikov & Sues 2004), it is most likely that they were not recognized during the segmentation process because of difficulties in confidently discriminating bone and sediment in the palate region. As noted above, the skull shows few sutures, so the other cranial elements are not described individually. In dorsal view (Fig. 3A–C), the nasals, frontals and parietals are broad elements forming a flat cranium, with the frontals and parietals probably longer than the nasals. The nasals span the width of the snout. The frontals are narrower than those of Kapes cf. majmesculae (Novikov & Sues 2004), so in dorsal view the orbitotemporal openings are less widely spaced than in the Russian specimen. The pineal foramen is a large, oval opening, whose posterior border is located slightly anterior to the posterior margin of the orbitotemporal fenestra. It is positioned in a shallow and broad fossa. The orbitotemporal openings are surrounded by frontal, parietal, postorbital, jugal, lacrimal and prefrontal elements (Fig. 5A, B). They are dorsoposteriorly elongated and in lateral aspect similar in shape to those of Leptopleuron (Säilä 2010). The shape differs in the steeper upwards curvature of the posterolateral margin, and the wider, more rounded anterior margin in BRSUG 29950‐13. The orbitotemporal openings of BRSUG 29950‐13 extend a little more dorsoposteriorly than in the PIN 4365/40 specimen of Kapes (Novikov & Sues 2004). Another procolophonid with similarly shaped orbitotemporal openings is Neoprocolophon (Young 1957), but, again, in BRSUG 29950‐13 these openings extend more posteriorly, with more pronounced tapering, and the posterolateral margin is not convex as in Neoprocolophon. The dorsoposteriormost portion of the right side of the skull is crushed (Fig. 3A). Emargination of the posterior margin of the skull is broad and not prominent. There is a small acute posterior process at the midline of the skull roof. The whole occiput of the skull is crushed (Fig. 4H, J). Only fragmented remnants of the opisthotic and prootic are present. Furthermore, a large part of the palatal side of the skull is not shown in the 3D model (Fig. 3D–F), because those bones were either crushed in the matrix or were not recognized during the segmentation process. The parasphenoid is largely preserved, and from its position, we can infer that the basioccipital is positioned posteriorly of the quadrate. The ventral temporal margin is very broadly excavated and turns downwards as it transitions from the jugal to quadratojugal. The quadratojugal is enlarged and bears a long, horizontal, posterolaterally facing process (Figs 3A–I, 4). There are also two smaller, radially oriented processes below the main one, a smaller process above the long quadratojugal process facing dorsally, visible only on the right side of the specimen, and a laterally facing bulbous ‘horn’ near the base of the long horizontal process. This lateral process is dorsoventrally flattened, triangular in ventral/dorsal view and its surface is rough and pitted, suggesting that during life it was covered by a keratinous sheath. Similar surface textures can be seen on quadratojugal processes in other procolophonids, such as Procolophon (Carroll & Lindsay 1985) and Leptopleuron (Säilä 2010). The surfaces of the smaller processes are similarly rough. The tips of the two ventral processes are connected by a web of bone, making a bony frill‐like structure below the long horizontal process (Figs 4, 5). This is the first occurrence of such a trait in procolophonids; as in the derived multispined clade, the Leptopleuroninae, all specimens known so far bear spine‐like processes that simply protrude from the skull (Sues & Baird 1998; Sues et al. 2000; Sues & Reisz 2008; Säilä 2010). This ventral bony frill is peculiar considering that the only other specimen of Kapes with a preserved cranium (PIN 4365/40) shows no quadratojugal spines (Novikov & Sues 2004). A prominent posterolaterally projecting quadratojugal process like the long horizontal one in BRSUG 29950‐13 is also found in Teratophon (Modesto & Damiani 2003), but there it is shorter and extends more laterally than in BRSUG 29950‐13. Furthermore, there is only a single quadratojugal process in Teratophon and no frill‐like structure below it, as in BRSUG 29950‐13. The quadrate is located just posterior to the level of the basipterygoid joint (Fig. 3D–F). Laterally, it is hidden behind the enlarged quadratojugal and is in contact with the pterygoid medially (Fig. 4B, D). The articular surface of the quadrate is transversely widened. A presumably small portion of the squamosal is exposed between the quadratojugal, the postorbital and the supratemporal. The squamosal is usually ventrally expanded and forms a distinct semivertical ridge visible in occipital view (Figs 4H, J, 5D), but the lack of sutures means that we can only guess at its extent. In the interpretive drawing in Figure 5D, we used Novikov & Sues’ (2004) Kapes cf. majmesculae as a reference and drew the extent of the squamosal similarly, extending dorsally backward and forming a thin process. Because a similar dorsoposterior expansion of the cranium is present in BRSUG 29950‐13, it is possible that such a process existed as well, but again we cannot be sure. The mandible is completely preserved and in its original articulation with the skull. It was asymmetrically deformed like the skull, so the description is based on the retrodeformed version (Fig. 3K). Before digital retrodeformation, the teeth on the right mandibular ramus were more circular in shape whereas those on the left mandibular ramus were more elongated and had oval occlusal surfaces (Fig. 3J). A minor difference is still present after retrodeformation, so it is worth noting that the description is based on the left mandible. We decided to do so because the lateral surface of the right mandible is embedded in the matrix and in the 3D model looks flatter as the details were lost during compression, or possibly during segmentation. As with the skull, the sutures were not clearly visible, so those shown in Figures 3, 5 and 6 are hypothetical and will not be mentioned in the description. The only detectable sutures were those between dentary, angular and surangular, but still not for their full length. These can be seen on the surface of the lateral side of the left mandible as narrow grooves (Fig. 4B, D). The mandible is short and massive. It is shorter than the skull but this is only because of the posteriorly elongated quadratojugal process. The shape of the mandible is very like that of the PIN 4365/40 specimen of Kapes cf. majmesculae (Novikov & Sues 2004), but it is shorter and with one tooth fewer in each dentary. There is a low ridge on the lateral surface starting from the anteriormost tooth, passing through the middle of the dentary parallel to the tooth row, and ascending via the proximal edge of the coronoid process to its top. This ridge makes the lateral surface mildly convex, whereas the medial surface of the mandible is almost flat (Figs 4-6). The dorsal and ventral margins of the dentary are approximately parallel. There are foramina below the second, fourth and fifth teeth. The dentary bears six teeth; the first two are incisiform, and the other four are molariform in shape. The first tooth is the tallest and most massive, with the base much larger than in the following three teeth, and it leans anteriorly. It is anteroposteriorly elongated, with an ellipsoid base. The second tooth looks like a smaller version of the first one, with the crown elongated diagonally to the long axis of the dentary. The bases of the incisiform teeth are positioned lower than the bases of the following, molariform, teeth. The four molariform teeth become progressively larger backwards. This distal increase in size was used as a character of Thelegnathus by Gow (1977), and was mentioned as a diagnostic character of Kapes by Spencer & Storrs (2002), but is also seen in Haligonia (Sues & Baird 1998, fig. 3), although in that taxon the most posterior tooth is drastically enlarged. In fact, the distal increase in size of the molariform teeth is widespread among procolophonids (Modesto & Damiani 2003). The third tooth, the first molariform, which is the smallest one in the tooth row, has an oval shape in occlusal view and is shaped somewhat between incisiform and molariform. Its long axis is positioned transversely to the long axis of the dentary, with the medial edge being positioned more posteriorly than the anterior one. The occlusal surfaces of the fourth to sixth teeth are heavily worn, and the teeth do not have distinguishable cusps, but rather one flat labially inclined surface which is in contact with the lingually inclined occlusal surface of the maxillary teeth. By the overall shape of these molariform teeth, they were either monocuspid or bicuspid with closely adjacent cusps. When examined from the labial side, the base of the sixth tooth is positioned slightly higher than the base of the first one. That tooth is also slightly longer than broad, in contrast to all the other teeth in the tooth row (Fig. 4H–I, Table 2). On the right mandible, however, all teeth are anteroposteriorly longer than labiolingually wide. This might be an artefact of that mandible being more compressed than the left one, which may also be reflected in some different details of the teeth on each side. For example, the molariform teeth on the right mandible show signs of a weak cingulum on their lingual surfaces, which can only be seen on the first and second molariform teeth of the left mandible. As for the third and fourth molariform teeth, those on the right mandible have clearly visible cinguli, but the same portions of the left counterparts are slightly concave instead. There is a low and wide coronoid process, the anterior margin of which is longer and steeper than the posterior one (Figs 4A–F, 6). There is some space between the posterior edge of the last tooth in the tooth row and the start of the process, unlike in Leptopleuron (Säilä 2010) where the last tooth is located at the base of the coronoid process. A similar distance between the distalmost tooth and the coronoid process can be observed in the BRSUG 26186 specimen of Kapes bentoni (Spencer & Storrs 2002, fig. 5). In medial view, the coronoid process forms the anterior margin of the long adductor fossa. The coronoid is almost identical to the coronoid of the PIN 4365/40 specimen of Kapes (Novikov & Sues 2004), differing only in a posterior margin that is less steep and lacking a bend on the posterior margin of the coronoid process. As we could not confidently recognize sutures, it was not possible to determine the posterior extent of the dentary bone, and consequently, the anterior margins of the surangular and angular. If the indistinct grooves on the lateral surface of the left mandible (Fig. 4D, F) are indeed sutures, then they would imply that the dentary extends below the posterior end of the coronoid process. Nevertheless, the postdentary part of the mandible is short for procolophonids, being only slightly longer than the dentary part of the mandible. Dorsoventrally, it is widest at the sagittal line of the coronoid process and tapers posteriorly. When viewed ventrally or dorsally (Fig. 3G–L), it is positioned more laterally than the dentary part of the mandible, so when both halves of the lower jaw are seen in dorsal or ventral view the jaws are broader than they would be if the dentary and postdentary mandible were positioned on the same axis. This feature is a little less pronounced on the right mandible, but since the coronoid process on that side looks flattened and deformed, we presume the right side suffered more severe compression than the left side. The jaw might be widened at this point to encompass the strong adductor muscle. The adductor fossa occupies half the length of the mandible in dorsal (Fig. 3K, L) and medial (Fig. 6B, C) views. The dorsal surface of the articular bone is roughly in line with the bases of the dentary teeth. The retroarticular process is transversely expanded, with the dorsal surface being concave posterior to the jaw joint (Figs 3L, 6B–C). The vertebral column of the specimen is rather well preserved, but only in its presacral part. Only neural arches, with neural spines, are visible on the surface of the fossil (Fig. 2A). The portion below the neural arches was the hardest part of the specimen to segment because of the heterogeneous matrix and vertebrae being deformed (and probably to some extent crushed) making them difficult to differentiate in CT images. It is to be expected that in an adult specimen neural arches and centra would be fused, but because the centra are embedded in the matrix they were segmented conservatively. They had suffered severe deformation and crushing, so it was not possible to identify sutures and differentiate them from neural arches. Because of this, the interpretation is limited, and we cannot draw proper conclusions about the features of the centra; the description will mostly deal with the neural arches and spines. Several articulated dorsal vertebrae are clearly seen in right lateral view, as they are exposed outside the matrix (Figs 2A, 7). Up to 15 neural spines and 11 neural arches can be observed, with two questionable elements at the anterior end of the vertebral column. If these are indeed bone material, it is hard to be certain which parts of vertebrae they might be or whether they belong to vertebrae at all, as they might be a part of the occiput. As procolophonids are known to possess from 25 to 27 presacral vertebrae (Falconnet et al. 2012), this means that BRSUG 29950‐13, with 16 vertebrae present, is preserved with 59–64% of the presacral vertebral column. The first six vertebrae (not counting the two dubious elements) are very fragmentary, with most of the neural arches and spines lost, but the neural arches with neural spines of the following vertebrae are almost perfectly preserved. The tall neural spines are flattened transversely and are parallelogram‐shaped in lateral view (Fig. 7A, B). This shape is especially apparent in vertebrae 7–13. Along the column, their heights increase, reaching a maximum at the eleventh vertebra, and then reducing posteriorly, forming a symmetrical arch. However, tips of some neural spines are eroded away so the arch may originally have been more prominent. They lean backward, a condition also observed by Säilä (2008) in an undescribed skeleton of Kapes, and in leptopleuronine procolophonids (Colbert 1946; Cisneros & Schultz 2003; Säilä 2010). The same condition is also seen in Soturnia (Cisneros & Schultz 2003), but its neural spines are bulbous and lean more backwards than in BRSUG 29950‐13. As the vertebrae with preserved neural arches are still in contact, zygapophyses can only be observed in dorsal view (Fig. 7C, D). The dorsal view shows the characteristic procolophonid appearance in which the zygapophyses flare laterally sufficiently that the neural arch is wider than long, roughly rectangular in shape, and with concave edges between the rounded zygapophyses at each corner. The prezygapophyses flare outwards anterolaterally and the postzygapophyses posterolaterally, with a concave lateral surface of the neural arch between them. The lateral extension of the transverse processes is moderate. However, they are elongated and positioned diagonally so that they extend from the midpoint to the anteroventral corner of the lateral side of the square‐shaped neural arch. Such processes are seen in articulation with the tubercles of ribs in Soturnia (Cisneros & Schultz 2003) and Sclerosaurus armatus (Sues & Reisz 2008). This was probably also the case in BRSUG 29950‐13, as some of the ribs have preserved tubercles. Transverse processes on neural arches are also seen in Procolophon (deBraga 2003), but these are much smaller and, based on articulation surfaces, deBraga concluded that only the cervical ribs were dichocephalic. However, we can be confident that all preserved ribs in BRSUG 29950‐13 are dorsal ribs, and some of them appear to be dichocephalic (Fig. 2B, C). Furthermore, two ribs on the right side are preserved in contact with the anteroventral part of the transverse processes, but they appear holocephalic, so it is not clear whether they are in place or not. In Procolophon, deBraga (2003) noted that postcervical ribs articulate with the ventral surfaces of centra, but he partly based his postcranial description of Procolophon on a specimen that was later given the status of Procolophonidae incertae sedis (Cisneros 2008b; Säilä 2010). In any case, we cannot see this in BRSUG 29950‐13. Even ribs on the left side of the specimen seem to be in contact with the lateral side of the vertebrae. However, this may just be artificial, as vertebrae were pressed against ribs during compression; if so, the ribs might just have been articulated with the ventral side of the centra. There are 9 ribs preserved on the right side of the animal, most of them partially broken off due to weathering, and 11 on the left side (Fig. 2). Ribs on the left side are more complete than those on the right side. The ribs are mostly still articulated with the vertebrae, although the articulation was probably altered due to compressional deformation. No cervical ribs are preserved. Preserved ribs start from a fragmentary remnant of the neural arch of the probable fifth vertebrae, and based on a uniform length and curved shape, it can be concluded that all preserved ribs are dorsal ribs; therefore, no sacral or caudal ribs are preserved. The size of the ribs does not vary significantly, and variations in length can probably be attributed to imperfect preservation. The longest is rib seven on the left side, which is equal in length to the sum of nine dorsal vertebral neural arches. This is rather longer than in Leptopleuron lacertinum (Säilä 2010) and Procolophonidae incertae sedis (deBraga 2003) which both have their longest preserved ribs only 6.5 times as long as the dorsal vertebrae. All ribs are slender and slightly curved. Left ribs 5 to 10 taper slightly towards their distal ends, but the others have flat ends that possibly articulated with costal ribs in life, as interpreted by deBraga (2003) in his Procolophonidae incertae sedis. Rib heads can be seen clearly on most of the ribs. The nature of the proximal ends of the ribs is ambiguous. The third rib on the right side is the only one that appears to be clearly dichocephalous (Fig. 2B). Since this rib is exposed outside the matrix, this cannot be attributed to poor segmentation (Fig. 2A). The only other explanation would be that some damage had occurred to the proximal head of the rib. The first two ribs on both sides have a vaguely dichocephalous appearance with some distinction between tubercle and capitulum. The head of the fourth left rib is partially broken, but appears to look the same. The fourth rib on the right side probably has a broken head, so is uninformative. All other ribs are holocephalous, but with a head separated into two parts, which could be interpreted as a conjoined capitulum and tubercle (Romer 1956), separated by a wide and shallow midline groove. A similar trait has been observed in most other procolophonids with preserved postcrania (Colbert & Kitching 1975; Sues & Reisz 2008; Säilä 2010; Falconnet et al. 2012). In his Procolophonidae incertae sedis, deBraga (2003) found that only cervical ribs were dichocephalous and all dorsal ribs were holocephalous. Dichocephalous heads are also possible in Soturnia (Cisneros & Schultz 2003). Even though MacDougall et al. (2013) mentioned that all ribs of Sauropareion were holocephalous, anterior ribs of two specimens (MacDougall et al. 2013, figs 1, 5) show the same condition as that observed in BRSUG 29950‐13: heads being vaguely dichocephalous and posterior ribs being holocephalous, but with the single head representing both capitulum and tuberculum. Therefore, it is possible that procolophonids had a few dichocephalous anterior ribs and the two heads would gradually merge in the more posterior ribs, a primitive condition observed in many Permian reptiles (Romer 1956). Along the dorsal and ventral surfaces of most of the ribs, a narrow groove can be observed. On the ventral sides, it runs from the proximal end to the midline of the ribs, but on the dorsal side, it does not start at the proximal end, except on the sixth rib on the left side, but rather at the point where the ribs start to curve. On the fourth, fifth, sixth and seventh ribs on the right side, the groove starts even more distally, closer to the midpoint along the dorsal surface. During the segmentation process, a difference in cross‐section along the length of individual ribs was observed. While in the proximal part, ribs have a flattened cross‐section shaped like a number eight, in their distal part they become more rounded or elliptical. Because of compression, it is hard to be certain of the true extent of the rib cage in life. However, BRSUG 29950‐13 appears to have had a slender body with a narrow torso, as in procolophonids such as Tichvinskia (Spencer & Benton 2000) and Procolophon (Colbert & Kitching 1975) as well as the Permian parareptile Nyctiphruretus (Cisneros 2008a). Compression during fossilization has certainly flattened the rib cage (Fig. 2), as evidenced by the fact that the four anteriormost ribs on the left side and the two anteriormost ribs on the right side overlap. However, the uniform array of the other ribs and the fact that all ribs were not substantially moved from their original positions could indicate that the ribs are only flattened and oriented towards the posterior end of the animal. Therefore, we conclude that in life BRSUG 29950‐13 was probably a slender and gracile procolophonid. Almost all elements of the pectoral girdle are preserved, lacking only the cleithrum, although it is not certain whether this element is really missing or evaded detection during segmentation. Both clavicles are complete, and they are not much dislocated from their original positions (Fig. 2B, C). They are curved, boomerang‐like elements, mostly broad, but with pointed tips. They appear to have a smooth groove on the medial portion of their ventral side and a concave dorsal side. It is possible that they were deformed this way during compression, but since this feature is identical on both clavicles we consider it to be an original feature. Their posterior portion seems to have been in contact with the craniolateral edge of the scapular blade. Because of the way the specimen was compressed, it is hard to form definite conclusions about their original positions, but, in the current state, the dorsal process of the left clavicle reaches the middle of the left scapular blade. The blade of the right scapula covers the dorsal process of the right clavicle, and it is moved from its original position more than the left clavicle. The clavicle here reaches further up the scapular blade. The interclavicle is fully preserved with some modest distortion at the tips of the lateral processes, twisting the right‐hand process slightly (Fig. 8). The element is characteristically T‐shaped, with the median process being a little more than 2.5 times longer than each lateral process, which results in an overall elongated appearance. The lateral processes have concave posteromedial margins and posteriorly curved distal ends, unlike the straight posteromedial margin seen in leptopleuronine procolophonids (Cisneros 2008a, p. 358; Säilä 2010, fig. 9B). There is a prominent ridge that runs along the cranialmost edge of the lateral processes, and then meets in the middle with the ridge that runs along the midline of the median process. At the place of contact, the ridges make a triangular shape. These ridges are seen only on the ventral side of the bone. The cranial side of the element has a narrow but deep groove which served as an attachment place for the clavicles. The interclavicle is like that of Procolophon trigoniceps (Colbert & Kitching 1975; deBraga 2003) and, interestingly, even more that of the owenettid Barasaurus basairiei (Meckert 1995). Both scapulae are preserved, but they differ in shape slightly (Fig. 9). The right scapula is exposed on the surface of the matrix (Fig. 2A), so it was probably damaged by weathering. Its current shape, however, can be related to the unweathered left scapula, and this one was used for the description. The scapula (Fig. 9) is slim, with the blade being roughly rectangular. The posterior edge is concave, whereas the anterior edge has a sharp turn towards the glenoid region. An acromion process is absent. The glenoid facet is oval, and there is a supraglenoid buttress above it. Next to it, on the lateral side of the blade, near its posterior margin, there is a depression that could be an artefact of compression. In all aspects, the scapula of BRSUG 29950‐13 shows striking similarities with those of Leptopleuron (Säilä 2010) and Sclerosaurus (Sues & Reisz 2008). The existence of a cartilaginous suprascapula is possible, as the distal edge of the scapular blade is straight and is like the margin seen in recent lizards with a suprascapula (e.g. Tinius & Russell 2014). Säilä (2010) also reported a rugose distal margin of the scapular blade in Leptopleuron, so it is possible that a cartilaginous suprascapular was present in procolophonids. At the glenoid surface, the scapula is completely fused with the posterior coracoid. The scapulocoracoid must have been somewhat flattened in a lateromedial plane during fossilization. In life, it was probably curved to form an arc fitting around the side of the somewhat curved rib cage, as observed in modern lizards (e.g. Tinius & Russell 2014). The right coracoid is rotated by 45° relative to the scapula, probably because of the deformation that affected the whole specimen (Fig. 9A–D). Alternatively, it could mean that the scapula and coracoid were not actually fused, and could have readily separated after death. However, this is not likely because the two elements of the left scapulocoracoid have remained in natural connection, and careful study during segmentation failed to reveal any sign of a suture. To our knowledge, this is the first occurrence of a single structural and functional scapulocoracoid in procolophonids. Although deBraga (2003) mentioned sutural contact between scapula, anterior and posterior coracoid, this was in a specimen referred to Procolophonidae incertae sedis. Fragments of both anterior and posterior coracoids are present in our specimen. The small relative size of the largest fragments and different shape between left and right counterparts suggest they are not complete bones and that they were possibly crushed during compression in the sediment (Fig. 2C). The present bones are also very slim and transversely elongated, instead of being circular, as is usual in procolophonids (Meckert 1995; deBraga 2003; Cisneros 2008c; Sues & Reisz 2008; Falconnet et al. 2012; MacDougall et al. 2013), which would confirm their incompleteness. Other smaller fragments could not be recognized during segmentation, so they are not shown in the 3D model apart from the three largest fragments (Fig. 2C). Only the posterior coracoid is fused with the scapula; it is hard to say whether the anterior coracoid was fused originally and, if it was, why both anterior coracoids are now disarticulated. It is possible that the sutural contact was weaker, or the compression forces were favourable for them to break off. The proximal fragments of the anterior coracoids are probably not preserved in their original positions and are both turned by approximately 180o from the glenoid fossa (Fig. 2C). The apparent symmetry and equivalence of this distortion are hard to explain in view of the other evidence for rotation and differences on right and left sides of the specimen. The partially preserved left forelimb is the only appendage preserved, and it shows the humerus, ulna and radius, but the two latter elements lack distal articulation surfaces as they were probably damaged by pre‐collection weathering. The ulna and radius are slightly shifted from their original positions relative to the humerus (Fig. 2C). All three bones have suffered compression, but the epipodials more seriously so. Their shafts are completely flattened, and when we tried to digitally decompress them, this required too much interpretation to restore their original appearance. The description is, therefore, based on the original, flattened epipodials. The humerus was digitally retrodeformed more successfully, using the method described earlier, so its description will be based on that version. The humerus is not complete, with the entepicondyle damaged and the area anteroproximal to the deltopectoral crest also possibly missing, although this cannot be confirmed with certainty from the CT scan. Careful examination failed to reveal any trace of bone in this area. However, in the CT scan it is not obvious whether this is because the humerus was crushed or because this is the original morphology of the bone. Because of these two missing parts, the humerus appears noticeably slender compared to that of other procolophonids (Cisneros 2008a). Its shaft is long and moderately thick (Fig. 10), but the proximal and distal ends do not expand as much as in Procolophon (even when taking the missing entepicondyle into account) and overall, the humerus appears elongated in comparison. The humeral ends are twisted at an angle of around 45° relative to each another, a derived amniote character seen in some other procolophonids as well. At the proximal end, the articulation facet has three expansions: the deltopectoral crest, the glenoid articular facet, and a dorsal ridge between. The prominent deltopectoral crest is positioned more anteroventrally than purely ventrally, but this could be superficial if the posterior part of the proximal end is missing. When observed in anatomical position, the proximalmost point of the humerus is positioned directly above the deltopectoral crest. The sulcus between the deltopectoral crest and the rest of the glenoid facet is harder to define than in other procolophonids (deBraga 2003; Säilä 2010) probably because it is atypically shallow. The ventralmost point of the deltopectoral crest is connected with the proximalmost edge of the humerus with a ridge, forming a single continuous surface. The posterodistal edge of the deltopectoral crest extends distally to merge with the posteroventral ridge of the entepicondyle. The distal end of the humerus is separated from the bone shaft by a transverse crack and the distalmost end is slightly dislocated, but still in the same orientation as the rest of the bone, so this damage does not affect the interpretation. The width of the crack was considered when measuring the length of the humerus. The distal end is approximately the same width as the proximal end. However, since the entepicondyle is partly missing, the distal end was originally wider. A large entepicondylar foramen is present (Fig. 10D, H, M). However, because the bone is damaged in this area, it was probably infilled with bone debris and as a result the bone does not look completely pierced. The ectepicondyle and supinator process are reduced and seem to be merged, with the entepicondylar process greatly reduced. Because of the damage and the imperfect segmentation of the distal edge, the trochlea and capitulum cannot be clearly distinguished and hence they will not be described, although a hypothetical trochlea and capitulum were added to the interpretive drawing (Fig. 10M), based on other procolophonids. In posteroventral and anterodorsal views (Fig. 10M, N), the preserved distal edge of the distal part is gently concave without any distinguishing features. The distal part of the humerus in anterodorsal view has a triangular depression in its middle part, formed by two wide ridges coming from the distalmost end and merging proximally, near the beginning of the stout shaft. The medial ridge could be the dorsal side of a supinator process. The ectepicondylar foramen is not present. A small hole on the ventral side of the shaft, visible on the 3D model just below the midpoint (Fig. 10A, E), is not a nutrient foramen but simply a missing part of the bone. This can be said with certainty because this part of the humerus is not embedded in the matrix. The ulna is considerably more robust than the radius (Fig. 2B, C), with the narrowest part of the shaft being twice as wide as that of the radius. The proximal end expands more than the proximal end of the radius and is slightly bowed in a medial direction, making the medial edge concave (Figs 2B–C, 11). There is a break across the olecranon, and the detail of the proximal articular face cannot be seen. The olecranon is short and somewhat rotated ventrally, but that could be a compression artefact. Moreover, compression rendered the sigmoid notch undetectable. On the dorsal side of the proximal end, below the olecranon process, there are two fossae (Fig. 11A). The bigger, oval‐shaped one is positioned distodorsally to the small and deep one, which is just below the contact between the olecranon process and the articulation surface. It is hard to say whether these features are genuine or artefacts of compression. On the ventral side (Fig. 11B), at the distal part of the expanded proximal end, there is a very shallow triangular depression that tapers distally along the shaft. This feature is also seen in Procolophon trigoniceps (deBraga 2003) and Barasaurus (Meckert 1995), but more proximally positioned. No depression can be seen just below the articulation surface in BRSUG 29950‐13, contrary to those examples above. The ulnar shaft is long and slender, but compression means its original cross‐sectional shape is unknown. A small chunk of the shaft is broken off on the medial side and is not to be confused with a nutrient foramen (Fig. 11A). A smooth groove runs along the shaft on the ventral side, but it is unclear whether it is natural or a compression artefact. Distally, the ulna shows signs of expansion, but the distal end is broken off, so further description is impossible. The radius is a slender bone, with the shaft gradually expanding evenly towards the ends, making it symmetrical along its longitudinal axis (Figs 2B–C, 12). The proximal end is slightly curved in a dorsal direction, but that could be a compression artefact. There is a wide but shallow groove running down the middle of the dorsal surface (Fig. 12A), from the end of the proximal epiphysis, narrowing at one‐third the length of the preserved bone, becoming even shallower, and continuing along the shaft, barely noticeable, and disappearing somewhere at the beginning of the distal expansion. At this scale, the articular ends cannot be described. Several cladistic analyses of Procolophonidae have been carried out, most of them based on the data matrix assembled by Cisneros (2008a). Here, we coded the new specimen of Kapes bentoni into the revised version of the Cisneros data matrix given by MacDougall et al. (2013), as follows: 1??11 ? ?201 3021? 111?? ?0?00 2?110 1310? ?? ?0C 11? ?1 00111 10??? ????. We ran the data matrix in PAUP 4.01a 152 (Swofford 2002) in a branch‐and‐bound‐search, with two uninformative characters (47, 52; equal to characters 46 and 51 in Cisneros 2008a) omitted. The Nexus file and character list are provided in Zaher et al. (2018), and we present the Strict and 50% Majority Rule consensus trees (Fig. 13A, B). Figure 13 Open in figure viewerPowerPoint Phylogeny of Procolophonidae. A, Strict consensus; and B, 50% Majority Rule consensus tree of 540 most parsimonious trees (tree length = 130 steps, consistency index = 0.6154, retention index = 0.7706, rescaled consistency index = 0.4742). Bremer support values are indicated above nodes; bootstrap values (100 replicates, only values >50%) are indicated below nodes. Abbreviations: PRO., Procolophoninae; THEL., Theledectinae. The 50% Majority Rule consensus tree (Fig. 13B) represents the 540 most parsimonious trees found in the analysis (tree length = 130 steps, consistency index = 0.6154, retention index = 0.7706, rescaled consistency index = 0.4742). The tree topology is like those found in previous analyses (Cisneros 2008a; MacDougall et al. 2013), but with Kapes bentoni added, a sister‐group relationship is indicated between the two species of Kapes: K. majmesculae and K. bentoni. The genus Kapes is, however, not very stable, with a Bremer score of 2 and bootstrap value <50%. The only reasonably secure portions of the phylogeny are the Procolophonidae as a clade, in comparison with the outgroups Owenettidae and Nyctiphruretus, and the derived Leptopleuroninae, all with Bremer support values >3 and bootstrap values >80%. In the Strict consensus tree (Fig. 13A), only Procolophonidae and some basal relationships, as well as the clades comprising Kapes + Thelephon, Procolophon + Thelerpeton + Teratophon, and the Leptopleuroninae emerge. In the 50% Majority Rule consensus tree (Fig. 13B), the Theledectinae, comprising Eumetabolodon dongshengensis and Theledectes, forms a separate clade basal to Tichvinskia and more derived forms, but it is weakly supported (Bremer support value of 1, bootstrap value 57%). The Procolophoninae as commonly understood (Cisneros 2008a; MacDougall et al. 2013) is split into two subclades: one, comprising Eumetabolodon bathycephalus, Teratophon, Procolophon and Thelerpeton, being a sister clade to Leptopleuroninae; and the other comprising Timanophon, Thelephon and the two species of Kapes. The clade comprising Kapes and Thelephon is barely supported, with a Bremer support value of 2 and bootstrap value of 63%, and the inclusion of Timanophon is even less certain, with a Bremer support value of 2 and bootstrap value <50%. Leptopleuroninae, as in previous cladistic analyses (Modesto et al. 2002, 2010; deBraga 2003; Cisneros 2008a; Säilä 2008, 2010; MacDougall et al. 2013), is relatively robust, especially as regards the inclusion of Sclerosaurus, Scoloparia, Leptopleuron, Soturnia and Hypsognathus, and their interrelationships (Fig. 13B). Here, Pentaedrusaurus, Phonodus and Neoprocolophon are included as basal members of the clade, with the same degree of uncertainty found earlier by Cisneros (2008a), Modesto et al. (2010), and MacDougall et al. (2013). Now that the partial postcranial skeleton of K. bentoni is known, we can address EXEMS 60/1985.9, a poorly preserved anterior portion of an interclavicle described by Milner et al. (1990, fig. 7b) from the Otter Sandstone, and tentatively assigned by Spencer & Storrs (2002) to K. bentoni based on its size. There is a general similarity in the size, shape, proportions and elements present, but the ridge on the anterior margin, and medial ridge are considerably broader than in BRSUG 29950‐13. Furthermore, the edge of the ridge is prominent in EXEMS 60/1985.9, whereas in BRSUG 29950‐13 there is a gradual transition from the ridge to the rest of the surface of the lateral process. If the morphology of the interclavicle of BRSUG 29950‐13 is indeed original, then EXEMS 60/1985.9 does not belong to K. bentoni, but to some other procolophonid. It is worth mentioning that we have only examined the published figure of EXEMS 60/1985.9, so there is a possibility that the authors used shading to overemphasize the ridge of the anterior margin. One more procolophonid taxon is known from the Otter Sandstone, but only from a fragment of a dentary (BRSUG 26312) which is too poorly preserved for precise identification (Spencer & Storrs 2002; Sues & Reisz 2008). The interclavicle of Sclerosaurus, which was mentioned as a possible original owner of that dentary (Spencer & Storrs 2002), is also considerably different from EXEMS 60/1985.9. Some other procolophonid skulls from the Otter Sandstone are currently under study (Coram et al. in press), so a more likely identification of EXEMS 60/1985.9 than K. bentoni might be revealed in the future. We reconstruct Kapes bentoni with some confidence (Figs 14, 15) because of the relative completeness of the current specimen, or at least its skull and anterior torso. Missing parts of the skeleton, primarily the posterior half of the vertebral column, the hand, and the pelvis and hindlimb, are reconstructed based on the skeleton of Procolophon trigoniceps, from deBraga (2003). The posture is as in earlier reconstructions, such as that by deBraga (2003). The life image (Fig. 15) shows Kapes bentoni with scales and scale‐covered bony skull projections, standing in a sandy setting, and hinting at possible burrowing habits (see below). Figure 14 Open in figure viewerPowerPoint Kapes bentoni Spencer & Storrs, 2002, skeleton reconstruction, based on specimen BRSUG 29950‐13, in: A, lateral; B, dorsal view. Missing parts of the skeleton (in lighter grey) reconstructed based on the skeleton reconstruction of Procolophon trigoniceps Owen, 1876 by deBraga (2003). Scale bar represents 10 mm. Figure 15 Open in figure viewerPowerPoint Kapes bentoni Spencer & Storrs, 2002, life reconstruction by MZ, based on specimen BRSUG 29950‐13 and skeleton reconstruction in Figure 14. Colour online. In the literature, procolophonids with preserved postcrania are predominantly juvenile and subadult individuals. To our knowledge, the few possible adults comprise: a ‘mature’ specimen of Pentaedrusaurus ordosianus (Li 1989); PIN 954/1, an almost complete specimen of Tichvinskia vjatkensis (Spencer & Benton 2000) of unknown ontogenetic stage; a specimen of Sclerosaurus armatus (Sues & Reisz 2008) of which the ontogenetic stage is not discussed; BP/1/1187, a specimen of Kitchingnathus untabeni (Cisneros 2008c) of unknown ontogenetic stage, but whose size is ‘compatible … with adults of other Early Triassic procolophonids’; and the Munich Procolophon specimen described by Broili & Schröder (1936). We interpret BRSUG 29950‐13 as an adult (or even possibly old) individual at the time of death based on the following features: (1) almost completely fused cranial sutures; (2) heavy tooth wear; (3) well‐developed quadratojugal spines; (4) neural arches fused with centra; and (5) fused scapula and posterior coracoid. Our specimen shows a characteristic reptilian pattern of ossification, with the fused scapulocoracoid being perhaps the most interesting considering the history of reports of postcranial skeletons in procolophonids. So far, all pectoral girdles reported in the literature have unfused scapula and coracoids. Falconnet et al. (2012) even suggested that ‘pectoral girdle elements did not co‐ossify during ontogeny’ in procolophonids. However, of all the specimens they mentioned as being mature and having nonossified pectoral elements, only one is potentially valid: a Sclerosaurus which is the largest procolophonid found to date, but the authors did not address the question of its ontogeny (Sues & Reisz 2008). All other authors (e.g. Colbert & Kitching 1975; Li 1989; deBraga 2003; Säilä 2010) in fact mentioned that studied specimens are juveniles or subadults. So, a more probable interpretation would be that in procolophonids pectoral elements fused later in ontogeny than all other elements. Because the pectoral girdle is not entirely preserved in BRSUG 29950‐13, we still cannot reject the possibility of pectoral elements never fusing entirely, or fusing much later in ontogeny, closer to the achievement of old age. BRSUG 29950‐13 enriches our understanding of the morphological diversity of procolophonids, as this is the first case of quadratojugal spines in the genus Kapes. This provides one synapomorphy for the Kapes–Thelephon clade of Cisneros (2008a), who defined the quadratojugal lateral surface as spineless in Kapes; this is not valid, as our specimen shows that at least one species of Kapes retained quadratojugal spines. The only other specimen of Kapes with a described skull, PIN 4365/40 (Novikov & Sues 2004), shows no sign of cranial spines or horns, but this might not be so surprising. For example, there is a great variability in the size and number of horns between different species of an extant iguanid genus, the horned lizard Phrynosoma (Presch 1969), with some species having almost no horns at all and others having heavily developed horn frills around the whole skull. It is also possible that the Kapes cf. majmesculae specimen is a juvenile that has not yet developed spines. Novikov & Sues (2004) did not discuss the possible ontogenetic age of their specimen and only provided drawings of the skull. In personal communication with Novikov (December 2017), we obtained photographs which confirm our interpretation of this specimen as a juvenile, with prominent skull sutures indicating not yet fully ossified bones. While it cannot be confirmed that other species of Kapes developed skull ornamentation later in ontogeny, this possibility cannot be ignored. There are some differences in the reported ontogeny of procolophonids known to have spines. For example, Procolophon juveniles lack spines entirely (Colbert & Kitching 1975; Carroll & Lindsay 1985), while in Hypsognathus (Sues et al. 2000) and Leptopleuron (Säilä 2010), spines are present even in juveniles. Comparison of the quadratojugal processes in K. bentoni with similar structures in extant animals permits some assumptions about their function. Perhaps the horned lizards Phrynosoma are the closest living analogues in terms of morphology. They are reported to use their cranial spines primarily in defence against predators (Winton 1916; Pianka & Parker 1975; Sherbrooke 1987; Young et al. 2004), but also in intraspecific physical combat (Whitford & Whitford 1973) and during copulation, when the male bites and holds the nuchal horn of the female (Tollestrup 1981). When in danger, the horned lizards tend not to attempt to escape, but to flatten their bodies and tuck the head down, exposing the horns (Winton 1916). Their cryptic colouration and lack of movement in that posture help them to avoid detection by predators (Pianka & Parker 1975), whereas raised horns make them harder to handle and swallow (Tollestrup 1981). This method of defence works on smaller predators, namely other lizards and snakes, but larger mammals and birds can manipulate the lizards, so they can swallow them, horns and all (Tollestrup 1981). Some care is required in applying such a model to interpreting the function of the horns in Kapes bentoni. In the lizards, horns fringe the top of the head, more like the bony frill in ceratopsian dinosaurs. Therefore, tipping the snout down raises the array of horns. However, although in K. bentoni the horns are tucked under the cheek, in leptopleuronine procolophonids the horns form more of a frill around several bones at the back of the skull roof. In horned lizards, the spines extend across the whole occipital region, with the squamosal and parietal horns being the longest, whereas in K. bentoni the longest horns are positioned laterally on the head. The morphology of cranial ornamentation in K. bentoni is most like the squamosal horns of Phrynosoma platyrhinos. Long outwards flaring spines enlarge the head of an animal and make it hard to swallow for smaller predators, but the question is how the position of horns affects defence. Are the long outwardly directed spines on the sides of the head more or less efficient than the posteriorly facing spines of Phrynosoma, or is there no significant difference? Young et al. (2004) found that selective pressure by avian predators on P. mcalli exerts a greater effect on the length of squamosal than on the length of parietal horns. As the squamosal horns in P. mcalli are closer than the parietal horns in position and orientation to the longest horns in K. bentoni, these quadratojugal horns in our procolophonid might well have had a defensive function both in making the animal look larger when the snout was tipped down, and in interfering with swallowing when captured by a predator that was only slightly larger. These would have included many of the Otter Sandstone predators, namely possible protorosaurians and poposauroids, as well as juvenile rauisuchians. Adult rauisuchians, represented by large teeth and footprints in the Otter Sandstone (Coram et al. in press), probably would not have been impressed, or hindered, by any horns on a small procolophonid. As well as defence, the cranial ornamentation might well have served an intraspecific display purpose, and thus been subject to sexual selection. In lizards, however, displays by males are usually aimed at other males in territorial disputes and not towards females for courtship (Noble & Bradley 1933; Tokarz 1998; Sacchi et al. 2015), and so are not directly sexually selected. In the absence of close living relatives, it is hard to interpret these procolophonid ‘horns’ further. The heterodont dentition of K. bentoni, with labiolingually broadened, two‐cusped posterior teeth, is like that of many other procolophonids. The current consensus is that such teeth indicate a diet consisting of high‐fibre plant material (Gow 1977) and possibly arthropods (Sues et al. 2000) or hard‐shelled invertebrates (deBraga 2003; Cisneros 2008c). The heavy wear in this specimen is interesting because there is evidence that procolophonids replaced their teeth during life (Ivakhnenko 1974; Gow 1977; Li 1983; Small 1997) before they became ineffective in food processing, but there is no sign of tooth replacement taking place in BRSUG 29950‐13. It is unclear whether procolophonids replaced their teeth throughout their entire lives. One specimen of Eumetabolodon (IVPP V.6070) described by Li (1983) was apparently so unusually old that tooth replacement had ceased and most of the teeth were worn away. Gow (1977) reported another aberrant adult Procolophon specimen with unusually small and mediodistally narrow teeth, which he interpreted as a specimen that was so old, and hence so big, that its normal complement of molariform teeth was used up and worn away, to be replaced by a new and abnormal set. Unless it was a pathological condition, this could suggest that at least some procolophonids continued to replace their teeth throughout life. Considering everything mentioned above, it is unclear whether BRSUG 29950‐13 was so old that its teeth had ceased to be replaced, or tooth replacement had not yet occurred in this set of teeth. The posteriormost molariform tooth on the maxilla is not as worn as other teeth, which could be explained by its position where it did not have much contact with other teeth and food, or it could actually be a recently replaced tooth. The state of tooth wear of BRSUG 29950‐13 is similar to that observed in a specimen of Eumetabolodon bathycephalus (IVPP V.6166; Li 1983). The posteriormost teeth are also less worn in this case. Existence of heavy tooth wear in at least three specimens of procolophonids could suggest that tooth replacement indeed ceased at some point, at least in some taxa. It has often been suggested that procolophonids were diggers (Sues et al. 2000; deBraga 2003; Säilä 2010; Botha‐Brink & Smith 2012; MacDougall et al. 2013). Taxa in which possible fossorial adaptations have been investigated in detail are: Hypsognathus fenneri (Sues et al. 2000), Procolophon trigoniceps (deBraga 2003; Botha‐Brink & Smith 2012), Koiloskiosaurus coburgensis (Botha‐Brink & Modesto 2007), Leptopleuron lacertinum (Säilä 2010), Sauropareion anoplus (Botha‐Brink & Smith 2012; MacDougall et al. 2013) and Teratophon spinigenis (Botha‐Brink & Smith 2012). In all of them, some features could be interpreted as adaptations for digging, but limb bones are never heavily modified, as in extant mammal diggers (Hildebrand 1985). Among suggested adaptations to digging, all procolophonids have solidified, akinetic, triangular or spade‐shaped skulls, Procolophon, Teratophon and Sauropareion show enlarged claws with robust nonterminal phalanges, Procolophon, Koiloskiosaurus and Leptopleuron have a distinct overbite, and Procolophon and Teratophon show thick cortical bone. MacDougall et al. (2013) mapped burrowing capabilities on a phylogeny of procolophonids and concluded that in the most parsimonious interpretation, procolophonids evolved from a burrowing ancestor or developed such behaviour early in their evolution. A fossorial mode of life perhaps played a role in the survival of this group through the end‐Permian extinction (Botha‐Brink & Smith 2012). Some features associated with fossorial animals can be observed in Kapes bentoni (Figs 14, 15). The skull is heavily ossified and solid, but is not wedge‐shaped and is only moderately spade‐shaped. The lower jaw is barely countersunk. As mentioned by Wake (1993), a solidified skull in fossorial animals is ‘necessary to withstand the resistance of a firm medium’ whereas skull shape ‘facilitates penetration and tunnel widening, therefore compaction’. A countersunk lower jaw reduces resistance in burrowing and prevents jaw opening (Wake 1993). However, a solidified skull is also needed for resisting forces of mastication (Carroll & Lindsay 1985) so this feature does not necessarily need to be an adaptation for digging but could be for feeding on tough materials, like plants and hard shells. The humerus and ulna do not show heavy adaptations for digging. Some scratch diggers today show a moderately enlarged ectepicondyle (Hildebrand 1985), but this portion of the humerus of Kapes bentoni is broken off. The medial epicondyle is an origin of digital and carpal flexors and of the pronator (Hildebrand 1985), so it can be very enlarged in forelimb diggers, which include all known reptile diggers. Our 3D model suggests that the deltopectoral crest is not positioned at the midshaft as in many diggers, in which the insertion for the muscles is located far from the joints to enhance the power of each stroke (Hildebrand 1985). Some procolophonids have values for the distal humerus width:length ratio that fall in the lower half of the range for modern scratch diggers (Hildebrand 1985); in Teratophon and Procolophon it is 0.48 and 0.53 respectively (Botha‐Brink & Smith 2012). However, we cannot measure this ratio in K. bentoni because the entepicondyle is not preserved. The olecranon process of the ulna, which is an origin for digital and carpal flexors, is also not enlarged, as is typical in reptiles that use their front limbs for digging (Hildebrand 1985). Animals with a fossorial mode of life do not usually possess cranial ornamentation, but Phrynosoma lizards are capable of burrowing when threatened, despite sometimes elaborate cranial ornamentation (Presch 1969). However, as MacDougall et al. (2013) mentioned, Phrynosoma, as desert dwellers, burrow in sand rather than soil, which differs in consistency and mechanical properties, so whereas cranial ornamentation could be a hindrance for regular burrowers, it has little effect on sand diggers. Putative tetrapod burrows in originally sandy substrates have indeed been reported from the Otter Sandstone (Gallois 2013), but these are much larger than would be expected of procolophonids. Specimens of Procolophon have been found in burrow casts in the Karoo (Groenewald 1991). In conclusion, Kapes bentoni shows minimal adaptations of the skull and the humerus for digging, and possible adaptations of the manus unfortunately cannot be observed in this specimen. However, as most extant reptiles dig to a greater or lesser extent, despite lacking specialized fossorial adaptations, it cannot be ruled out that it was a facultative head‐assisted fore‐ or hindlimb digger. We thank Tom Davies for providing advice in scanning the specimen, Benjamin Moon for scanning the specimen and, together with Stephan Lautenschlager, training MZ in 3D digital modelling techniques, as well as for their assistance with the software. We also thank Igor Novikov for providing us with photographs of the specimen PIN 4365/40. MZ thanks University of Zagreb and The Agency for Mobility and EU Programmes on behalf of the European Commission for funding her research visit to the University of Bristol Palaeobiology Research Group as part of an ERASMUS+ Internship programme. This research was also funded by NERC BETR grant NE/P013724/1 to MJB. Sean Modesto and an anonymous referee provided comments on an earlier draft of the manuscript.